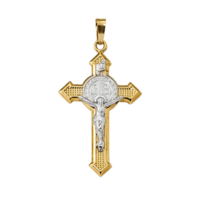 14k Two Tone gold San Damiano Cross. This distinctive Crucifix measures 26mm x 20mm across and is also available in a larger 33mm by 25mm. Very symbolic Crucifix. Stylish 14k Gold St. Benedict Crucifix pendant. Pendant measures about 32mm in length by 19mm across. St. Benedict is the Patron saint of Europe, students, and agricultural workers. The white gold is Rhodium plated and polished. 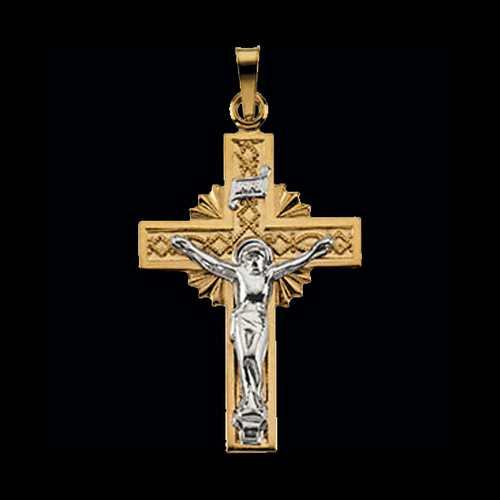 Cross includes the INRI and is made in the United States. 14k Two Tone Cara Vaca Crucifix pendant. The Cara Vaca Crucifix meaning; During the Moor occupation of 1231 in Cara Vaca Spain, the Pectoral cross of the Patriarch of Jerusalem appeared through a window, enabling an imprisoned priest to say mass for curious and angry captives. This Crucifix measures 38mm in length by 19mm across. Gorgeous 14k Yellow gold Crucifix pendant. This Italian made Crucifix features a polished finish and measures 30mm in length by 21mm across. 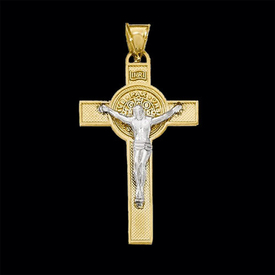 Symbolic Crucifix is part of our Guaranteed for Life jewelry, if this pendant is damaged for ANY REASON return it for a replacement. If the item is discontinued we will replace with a similar item. 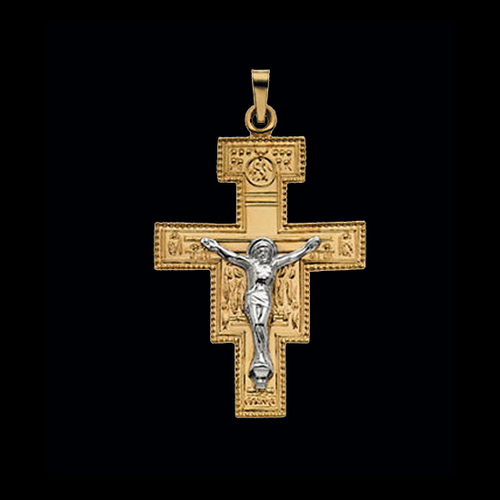 14k Gold Large Crucifix pendant. This symbolic pendant measures 47.3mm in length by 25.5mm across and weighs 4.21grams. Order this religious symbol of faith in 14k Yellow or White gold. 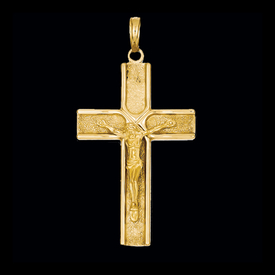 Beautiful 14k Gold Crucifix pendant. Crucifix measures 30.5m in length by 19.25mm across and is a lovely symbol of your faith to wear close everyday. Design is available in 14k Yellow or White gold. Large Two-Tone polished crucifix pendant. 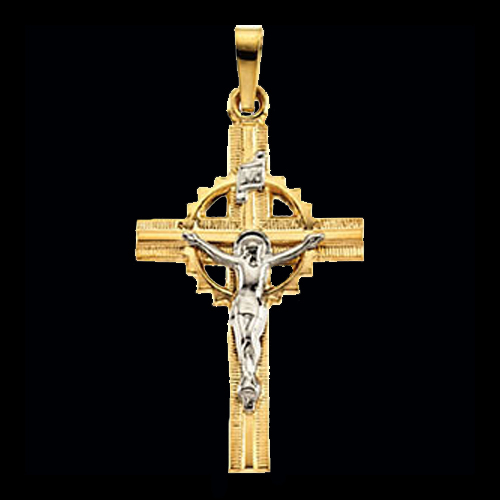 This 14kt Gold Crucifix features the INRI symbol and measures 39mm in length by 22mm wide. The bail measures 5.6mm long by 2.25 mm wide. Crucifix is hollow. Two Tone Iona Crucifix. 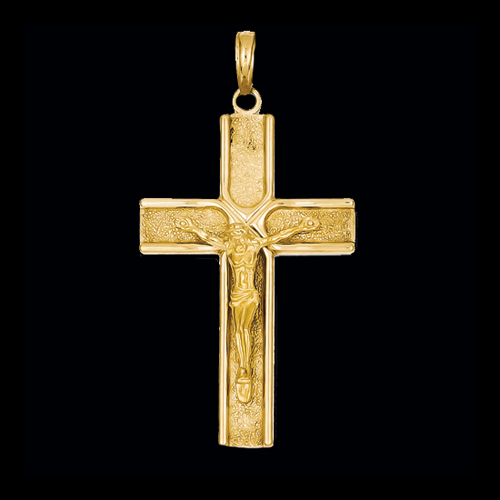 14k Gold Crucifix measures 37mm including the bail by 17mm across. The circle around the cross symbolizes eternal life. What a beautiful Crucifix. Beautiful 14k two tone gold St. Benedict Medal Crucifix. This lovely reversible Crucifix design measures 34mm including the bail by 19mm across. The back is one tone 14k yellow gold and features the St. Benedict Medal. Crucifix features a textured polished finish. 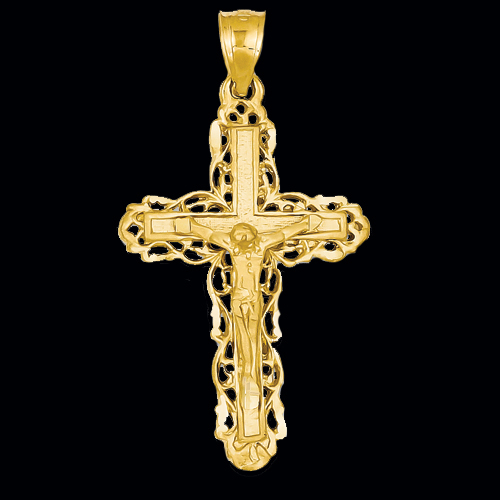 14k Gold Filigree Crucifix pendant. This lovely design measures 56mm in length including the bail by 30mm across. 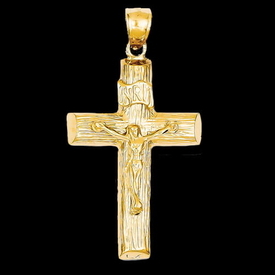 Gold Crucifix cross weighs about 4.07grams. Crucifix features a diamond cut polished finish. 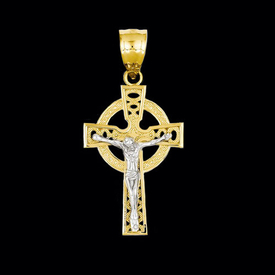 14k Two Tone Crucifix is a Celtic design. Crucifix measures 30mm in length before the bail by 20mm across and weighs 2.9grams. 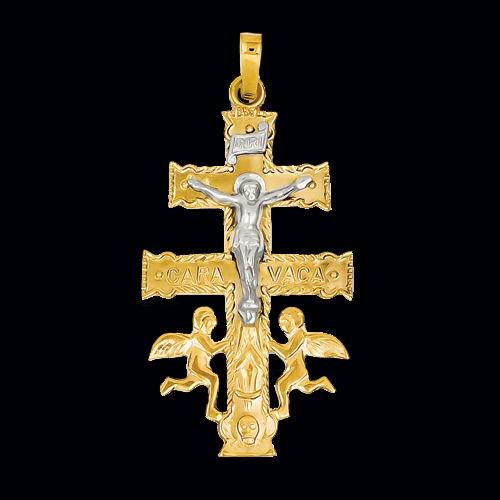 Pendant is embossed with the INRI across the top arm. The circle around the crucifix symbolized eternal life. Beaded accents give this Crucifix a unique style. 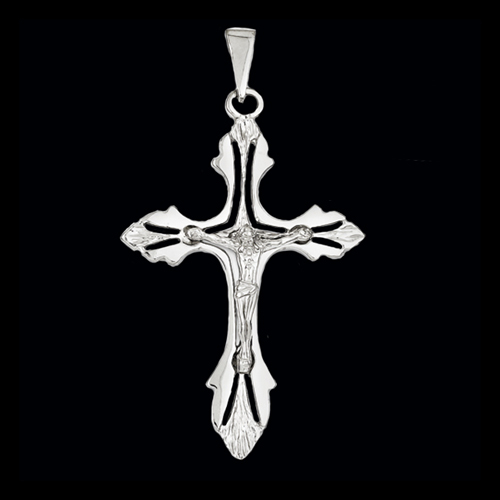 Large Masculine White Gold Crucifix. 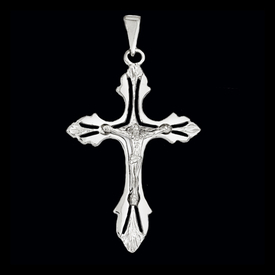 14k White gold large Crucifix pendant measures 67mm in length by 31mm across and weighs 5.61grams. Features include a flat open back, solid design, and a textured polish finish. Fancy Two Tone Gold Crucifix. 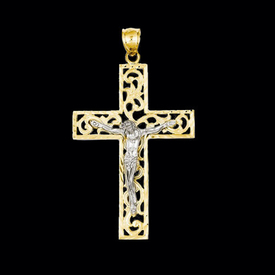 Elegant design, 14k Two Tone gold Crucifix pendant measures 38mm top to bottom (50mm including the bail) by 28mm across. This Crucifix weighs 2.97grams. Features include a textured back, diamond cut design, polish and satin finish. 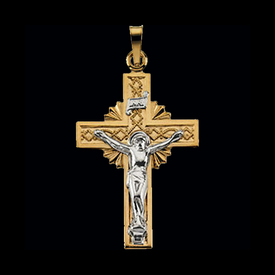 Ornate Diamond Cut Crucifix pendant. This great 14k gold Crucifix design features a diamond cut and satin finish and measures 42mm top to bottom by 23mm across. Fantastic style, pendant weighs 4.15grams. Splendid Two Tone Crucifix pendant. 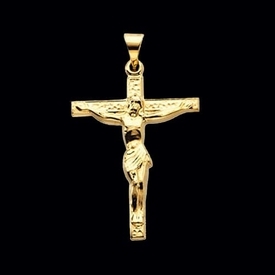 14k two tone gold Crucifix is measures 35mm in length by 24mm across. 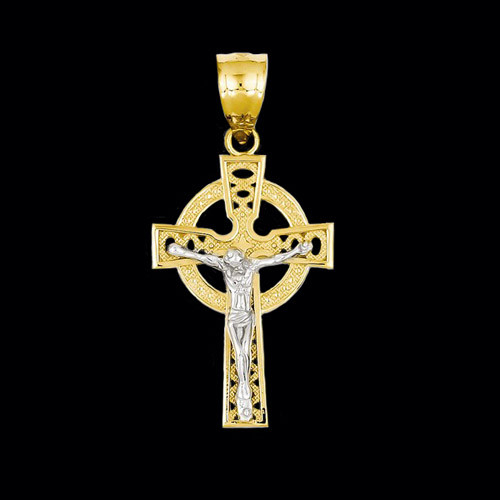 Crucifix features the Celtic circle symbolizing eternal life and the INRI banner which stands for "Jesus of Nazareth, King of the Jews". A great symbol of faith you'll want to wear everyday. 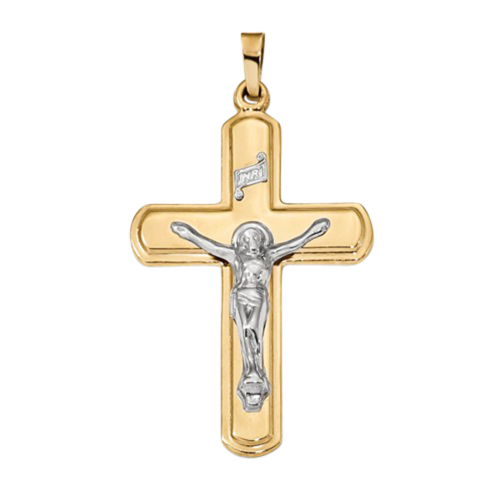 Satin & Polished Gold Crucifix Pendant. 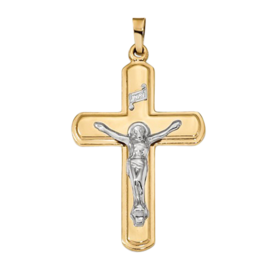 Distinctive 14k yellow gold satin and polished finish crucifix pendant. This pendant measures 44mm by 22mm across. Polished body and a satin cross with polished edges create this lovely crucifix design. Crucifix weighs 2.92grams. 14k Two Tone Gold Crucifix. 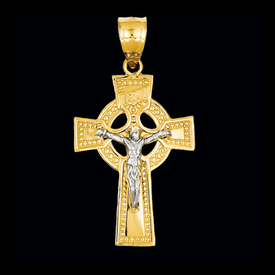 Crucifix pendant is available in 2 sizes starting with a 27.5mm and a larger 32mm version. Fancy design features the INRI banner in white gold and the circle of life celtic design. A great symbol of faith you'll want to wear everyday. 14kt Tri Color Shroud Crucifix. Symbolic Crucifix pendant with shroud. Cross is topped with the INRI banner which means "Jesus of Nazareth, King of the Jews". 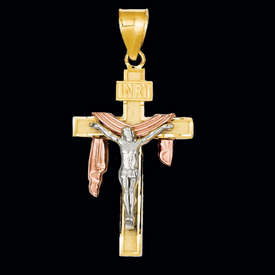 Crucifix is 14k yellow gold, the corpus is 14k white gold, and the lovely shroud is 14k rose gold. This loving pendant is available in 3 sizes starting with the 23.50mm in length by 15mm across. A great symbol of faith you'll want to wear everyday. Attractive 14k Yellow gold Crucifix pendant. Crucifix measures 44mm including the bail and weighs 5.1grams. The crucifix is a wonderful and symbolic display of your faith. Great for everyday wear. Got a loved one celebrating a birthday soon? Is your niece getting confirmed this weekend? Show your love by purchasing one of our designer crucifix pendants. Gracious Rose has sold over $1,000,000 worth of jewelry to people all around the world. We have built a trust on quality; a reputation we have been building ever since 1992. There is so much to choose from: with over 6500+ pieces, and the availability of special ordering like resizing and engraving; it is all you need in a jewelry shop, with the added convenience of shopping from the comfort of your own home. Aside from the usual platinum and diamond rings, we also offer 14k gold crucifix pendants. Man has always had a fascination with gold. It is arguably the most recognizable metal in the world today, which makes it the perfect metal for our designer crosses. Each pendant is designed to give its wearer a level of beauty and elegance. Wearing one is a way of telling the world you’re a Christian and you’re proud of your faith. There’s nothing wrong with showing off your love for God. Many people argue that wearing a crucifix is displaying a symbol of torture and death around your neck. While this may have been true during Jesus’ time, today it is widely accepted that the crucifix is an enduring symbol of Christ’s sacrifice for the benefit of mankind. Today, the cross is a widely used symbol that not only a religious symbol, but a fashion statement as well. Women who want to have jewelry pieces, that not only ooze class, but also significance, choose to wear cross pendants. Cross pendants add subtle style and meaning to your wardrobe. For a show stopping, classic and clean look, choose platinum. Platinum is a stunning metal that symbolizes exclusivity and durability. Your loved ones deserve only the best. Gracious Rose has a wide selection of exquisite jewelry to choose from for that perfect gift that will bring them joy for years to come. For starters, our Gold Passion Design Crucifix Pendant sells for $69.99. Pay $74.99 for a simpler yet classic-looking pendant, our Classic Two Tone Crucifix. 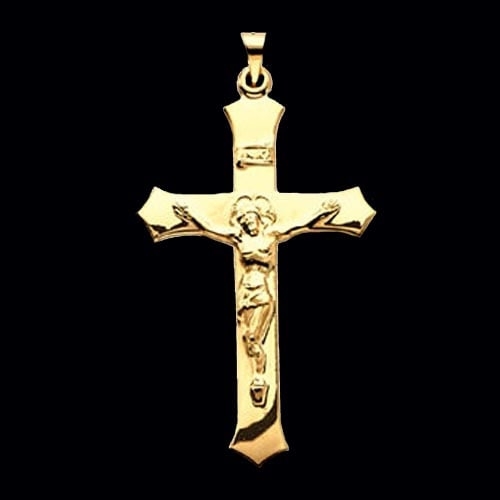 Stepping up the price, we have the Two Tone Crucifix, a pendant that will wow you with its royal shade. 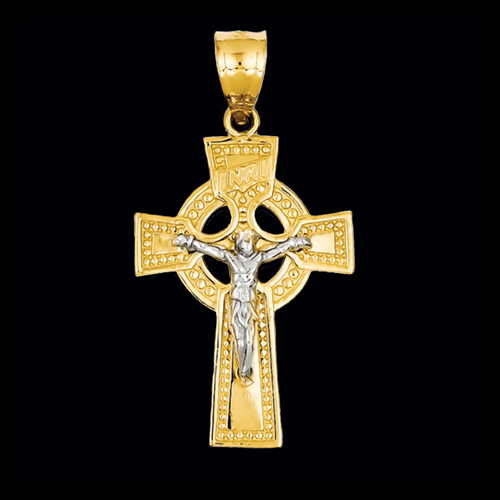 If Celtic crosses are your cup of tea, you may get our Celtic Crucifix Pendant, which goes for $149.99. Browse the rest of our pendants on our gallery for a wide range of prices and designs. 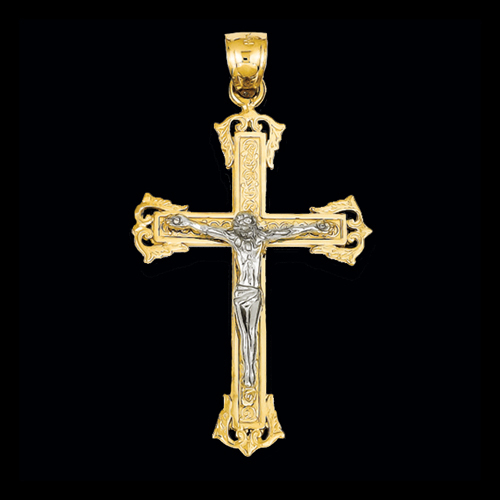 Our designer crucifix pendants have unrivaled elegance and craftsmanship. Each one is painstakingly dealt with by masters of the craft. A purchase from Gracious Rose won’t disappoint, so do buy your very own pendant. Right now! You can take advantage of our fully-customizable layaway plan with zero interest and free shipping for products over $250!